Surprisingly affecting for a madcap romantic comedy, She Was Pretty starts off strong with a first episode I really liked. But more than that, I absolutely LOVE the characters, and have a feeling they’ll be a winning combination. I’m relieved that the first-love story is more poignant than trite, but that’s nothing compared to the awesome girl bonding we get between our two leading ladies, which is sadly so rare in dramaland as to be a real anomaly. Ratings may have started off disappointingly low (4.8% for the premiere, against Assembly’s 5.4% and Yong-pal’s 21.5%), but I’m so encouraged by how much I responded to the first episode that I already don’t care. We follow a man whose face remains unseen as he puts together a puzzle of a Renoir painting, which is missing one piece. Then he looks up someone online—the name is KIM HYE-JIN, and we can surmise from the stack of handwritten letters in his keepsake box that she was a childhood friend. But those letters were all returned to sender, leaving him without a clue. He must be the sender, JI SUNG-JOON (Park Seo-joon), who’d mailed those letters to Hye-jin in Seoul while he’d lived in New York. At a trendy pool-slash-nightclub, a party rages on around the leggy birthday girl. She’s MIN HA-RI (Go Jun-hee), and she calls her friend to complain about not being here yet. Her friend is busy working at a bar, though she lies that she’s on her way. 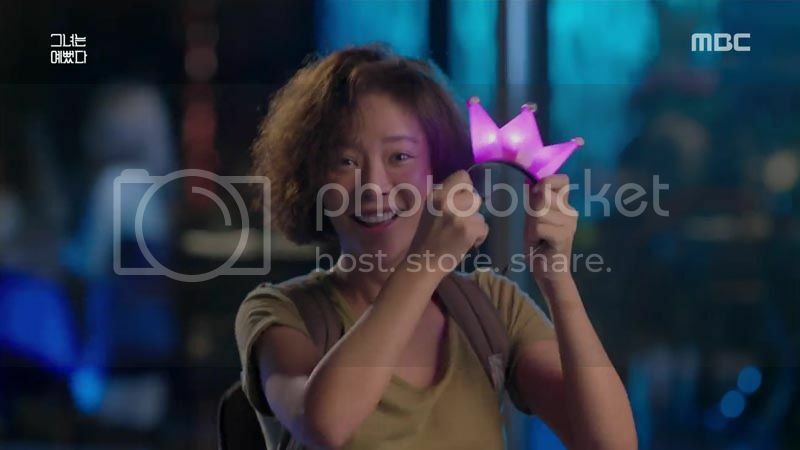 The friend is frizzy-haired and ruddy-faced (Hwang Jung-eum), and she serves popped corn to a table of disgruntled men who’d much rather be served by the pretty other waitress, which they request directly to her face. She’s got a positive attitude and admirable bounce-back, agreeing that the other girl’s nicer to look at; she assures them that the other girl will bring them their order. This is the elusive Hye-jin, and she hurries to Ha-ri’s party afterward, finding her surrounded by rich oppas vying for her attention with pricey gifts. Ha-ri can hardly contain her boredom, but perks up considerably when Hye-jin arrives, squealing at “Wifey” to join her. Aw, they’re cute. One oppa marvels that Ha-ri could have “that kind of” friend, which earns him a swift stiletto to the foot. Dig that sucker in, girl. Ha-ri returns the expensive necklace he gave her and tells him to get lost. Ha-ri’s all set to ditch everyone to eat dinner with Hye-jin, but Hye-jin insists the birthday girl return to the party. As she eats by herself, Hye-jin gets a text reminding her of her upcoming student loan payment, and takes a wistful look around at all the free-spirited people here. But she only lets herself feel down for a moment, bucking up right away. But when Hye-jin’s feet touch the bottom of the pool, her eyes pop open and she simply pushes herself back upward. Good girl. All the attention centers on Ha-ri, and Hye-jin trudges home, soggy and glum. In the morning, we find that the friends are also roommates. Ha-ri gets up in a mist of soft lighting and breakfasts on one apple, while Hye-jin jolts awake and scarfs down a full meal, to prepare for a big job interview today. She’s in the thick of employment-hunting, all of her energies focused on securing that holy grail of the full-time job. Once at the office, Hye-jin gets on the elevator, only to be pressured into stepping off when the weight capacity buzzer sounds. Another woman boarded later, but she’s prettier, so off Hye-jin goes. Then to her surprise, the doors reopen as the pretty woman is instructed to leave, making room for Hye-jin instead. What, you’re not gonna show us the face of the guy responsible? Fine, be a tease. The interview is for an intern spot at a magazine, and Hye-jin’s middling credentials earn smirks from the more qualified candidates. To rub salt in the wound, upon her exit she’s hit with loose trash flying in the wind and raindrops from a sudden storm. Arriving in her neighborhood, she sees roommie Ha-ri making out in a convertible and scolds her for the public display of affection, and with a guy she isn’t even sure she wants to date yet. She asks if Ha-ri’s ever been in love with any of her guys, and Ha-ri asks what that true love is. I think that’s your answer. Hye-jin waxes poetic about romantic things, while Ha-ri scoffs at the idea, preferring to just date whomever interests her, for as long as he interests her. Ha-ri adds that all men are basically the same, so there’s no need to split hairs. She advises Hye-jin to abandon her old-fashioned ideals and just date. Hye-jin points out that nobody wants her, not that she doesn’t have her plate full with other concerns. Hye-jin is pleasantly surprised to receive an email from Ji Sung-joon, which is full of questions about what she’s up to and ends with a request to meet when he arrives in Korea. Ha-ri remembers him as a chubby loser who’d moved into her house after her family moved to Japan, and was shocked when she later heard Sung-joon and Hye-jin had become best buddies. But Hye-jin is thrilled at his request to meet, smiling to recall Sung-joon as a sweet, innocent boy. On the day of their meeting, Ha-ri drives Hye-jin and lends her her cell phone (Hye-jin’s broke in the pool dunking), though she’s at a loss as to why her friend would be so eager to see Chubbo again. Hye-jin says he was her friend and first love, which Ha-ri can’t believe. As Hye-jin arrives, we linger on two men also arriving in the same parking lot. One’s chic and sleek in a nice car, and the other’s a leather-clad bad boy on a motorcycle. The chic one enters the museum first, just as a teacher explains a Renoir painting (the same one in the puzzle, “Dance in the Country”) to a group of schoolchildren. He’s our hero Sung-joon, and he interrupts to correct her assumption that the dancers in the foreground are the main characters, suggesting that there’s another way to read the scene. Then Mr. Motorcycle arrives—he’s KIM SHIN-HYUK (Choi Siwon), and he introduces himself as a feature editor here to write about this exhibition. Sung-joon smiles when Hye-jin texts that she’s arrived, while outside, she waits with nervous anticipation. She spies a fat man sitting alone eating a pastry and grabs his hands enthusiastically, squealing that it’s great to see him again, which of course doesn’t go over well when he huffs that he’s not Sung-joon. Then Sung-joon calls to confirm that she’s near the fountain, and heads over waving in her direction. Sung-joon realizes he’s approached the wrong woman just as Hye-jin hangs up on him. She runs out of sight and rejects his call, and a glimpse of her reflection causes all the recent painful slights to rush back to her. Snubbed for her looks, rejected for her specs. She tells us that after Sung-joon immigrated to the U.S., her wealthy family was ruined, and the pretty looks she inherited from her mother were overpowered by her scraggly father’s genes. So Hye-jin chokes back tears as she finds Ha-ri, telling her friend why she left. The beautiful Hye-jin in his memory had completely vanished, and she’d been afraid of looking even more pathetic in his eyes. Ha-ri exclaims that Hye-jin’s totally fine and should meet him anyway, but Hye-jin counters that on top of the looks are her sad status as a 30-year-old unemployed loafer. She’d rather preserve the first-love fantasy. She sighs that she wishes she could borrow Ha-ri’s appearance just for today… and that sparks an idea. A short while later, it’s Ha-ri who shows up at the fountain where Sung-joon’s still waiting. He lights up while she awkwardly says hello, and then he pulls her into a hug. “I missed you, Kim Hye-jin,” he tells Ha-ri. Flashback to Hye-jin and Sung-joon’s first meeting. She had dropped by his house soon after he’d moved in and introduced herself. He’d been so startled he’d run away, only to show up in her class. The next time she dropped by, he was working on that Renoir puzzle, and Hye-jin had seen the small face in the background. Ah, that’s the missing piece from the first scene. Sung-joon had shared his opinion that the lady was looking at the man in the foreground, nursing a one-sided crush. Hye-jin had called the lady a hidden picture, easy to miss entirely if you’re not searching for it. The couple heads to a restaurant for dinner, while Hye-jin eavesdrops from a nearby table. Sung-joon is clearly bursting with curiosity but asks questions slowly, while Ha-ri fidgets uncomfortably, replying according to the instructions Hye-jin had issued. She sticks to vague comments, but missteps when asking after his mother, which causes Hye-jin to leap up and signal madly that Mom’s sleeping in the sky. Thankfully, Ha-ri smooths it over and he doesn’t think too strangely of it. Sung-joon explains that he came across a box of their old letters recently, which made him want to see her again. He asks why she stopped writing, and she gives the pre-planned answer that her family moved to Japan and she lost his information. Sung-joon says that he also found the puzzle, but Ha-ri doesn’t even know what a “puh-joo” is and stalls while Hye-jin scribbles a note. She has no idea what “hidden woman” means, but mentioning her makes Sung-joon happy. It’s clear that Sung-joon wants to meet again, but as the date winds down Ha-ri follows Hye-jin’s instructions and gives him her excuse. He’s floored when she says she’s leaving to study in England tomorrow, but he regroups and figures they can keep in touch and meet on his work trips to England, which happen several times a year. But he can’t let things end just like that, and asks her to wait five minutes. He races to a shop and returns with a box, saying she can use it to avoid “the disliked thing.” He offers a handshake that he can’t quite let go of, and then hugs her goodbye. Around the corner, Hye-jin blinks back tears. The gift is an umbrella, which stirs a specific memory. Flashback to a school trip on a rainy day. Sung-joon suddenly gets up and asks the driver to open the doors, and Hye-jin watches in concern as he steps off the bus alone, shaking in the rain. Sung-joon whimpers about his mother and being scared of the rain, but suddenly Hye-jin is there with him, holding a shirt over their heads. When he’d left for the States, he’d given Hye-jin that puzzle piece of the hidden woman, so they can finish the puzzle when they meet again. Then he’d kissed her before running off to make his flight. On the upside, Hye-jin gets hired as an intern at a magazine, and she shows up for her first day full of enthusiasm. Even when minor hiccups arise (like ripping her slacks on the way in), she brushes them aside with her eternal optimism. Also heading inside is editor/bad boy Shin-hyuk, who looks cool, but is actually much less cool than he thinks. He tosses a piece of gum in the air and misses his mouth, and when he bends over to retrieve it, he trips Hye-jin, who faceplants on the pavement. She wails in pain, thinking the gum is her front tooth. Shin-hyuk offers assistance, but she bolts up and dashes inside lest she be late on her first day. The company has hired two interns in their management support department, and the other one is a fashionable young woman with a distinct air of snootiness about her. The internship will last three months, at the end of which they’ll be up for full-time employment. Hye-jin is given her first task and races around madly running errands, while the other intern sits around. Still, Hye-jin tackles her work with alacrity, super excited to finally have a job. In the following days, she takes on every assignment efficiently and competently, and her boss crows that he was right to hire her… because it would have been a productivity-killer to only hire attractive women—they just make the men slow down and then quit to get married. He wanted someone who would never get texted by a man or resist working late because of dates. Barf, you stupid little man. Then he gives Hye-jin the task of dropping off a box with another department within the company, The Most magazine’s editorial team. She heads to the flashy Most office and makes the delivery, only to be mistaken for someone else and given another errand. She leaves that box with a Most editor outside, hurrying away before recognizing him as motorcycle-riding Shin-hyuk. He recognizes her vaguely, but can’t quite place her. Somehow Hye-jin gets roped into even more work for Most—ha, they mistake her for the new freelance copy editor, and she’s given stacks of papers to proof. Hye-jin attempts to ask why she’s being assigned this work, but everyone at Most just cuts her short and issues directives, so Hye-jin finds herself making coffee runs to a fashion shoot on top of everything. She’s exhausted by the time she finally makes it out, and then the Most team realizes the mixup when the real freelancer shows up. The editors wonder who Hye-jin was, noting that she did all her work perfectly. The next day, Hye-jin is transferred to Most on a temporary, three-month assignment. She isn’t keen to return there, but Most has the most pull within the company, and what they want, they get. So off she goes, where she’s shown her seat and once again eyed by Shin-hyuk, who continues trying to figure out where he’s seen her. Heh, if he can’t think back two days, I fear he may never know. Sung-joon enters Most’s office, and the editor-in-chief introduces him as their New York transfer, now their deputy editor. These characters! I luff them! It’s very early to be loving anything without qualification, but they really won me over with this foursome. I’d expected to like Hwang Jung-eum and Park Seo-joon together, having seen them acting together before, and I expected to like Siwon since he’s the best cocky doofball around, but Go Jun-hee was a surprise. Which speaks to the writing of her character, since she’s normally got a cooler, less friendly vibe. I did like her as the little sister in What’s Up Fox, but that doesn’t compare with Ha-ri here, who makes a great counter for the bubbly heroine. Hwang Jung-eum’s brand of indefatigable pep really works to the character’s advantage here, and that’s not something I can say of all her characters. (I think she’s a good actress, but I dearly wish she would sometimes turn her energy dial down a notch. Not everything has to be emoted at 11!) But because Hye-jin’s energy is put on, it comes off as a bravado meant to protect, to cover up how much it hurts that people treat her like crap because she doesn’t fit their idea of pretty. As to the whole prettiness point—that was the part that had me the most worried about this drama going in, especially when it was promoted using the words “ugly gene” and calling her “bomb woman” (slang akin to eyesore). It’s a potentially tricky premise to base a show around someone being valued for their looks, but the show’s approach is to focus on the effects of her ugliness. We’re not making value judgments about the ugliness itself, but portraying how less attractive people are disregarded by the entire social order, and that’s something that resonates. Also, Hye-jin’s fear of being a disappointment rings very true; I thought that entire exchange around their reunion was played in a lovely, heart-tugging way. I appreciate that Hye-jin’s not so down on her looks that she ties up her self-worth in it; it seems like she’s largely disregarded it and rolls with the punches as gracefully as she can. But combined with insecurity over not becoming anything in her life yet and the potency of a first love fantasy—well, I totally get her. I loved her as a child for being sweet to Sung-joon and not thinking anything of his appearance, but you grow up and can’t expect the same open mind of the world, sadly. As for Park Seo-joon… omg why is he so hot? I’ve thought he was hot before, but man does he really do it for me as Sung-joon. It was almost painful watching him with Ha-ri, knowing what he didn’t, but that’s the kind of angst I always think hurts in a good way. He already feels something’s off about Ha-ri, but we’ll have to see how long the fantasy can hold up to the reality in front of him… and how long it’ll take him to recognize the real Hye-jin. I simultaneously want him to figure it out immediately and very very slowly, and can’t decide which is better. But at least the anticipation is a good thing. I love this show already! It's exactly the kind of rom com I was looking for. Me too! Thanks JB for the recap! i can't take this! it's only the beginning of the semester and i was glad nothing other than twenty again caught my attention but it looks like i'll be tuning in for this one. it already sounds great! Thank you for the recap - i've been waiting. Urg, I knew that! Thanks! I love it SO MUCH. Like, I already was weirdly optimistic about it, but I love it so much more than I thought! It got off to a brisk start and didn't wait to get right into the meat of the story. I love the leads, the second leads, and the writing & directing feel really assured so far. I know first love stories are everywhere in dramaland, but these two? These two are freakin' adorable. Pleasantly surprised by the drama's use of A Dance in the Country and how they're tying it into the drama's central conflict. Love the ending narration, especially with the hidden picture hunt. Although it's hard to buy HJE as ugly, I certainly buy into her conflict of not wanting to ruin the perfect image her first love had of her, especially when it's the one important person she had before everything got worst for her. It's her sweetest memory, and him walking right past her was probably the closest thing to real rejection that she could take. In the end, I think we all know that him walking up to that girl was no different than her walking up to the fat guy in glasses, but to her, it's so much harder not to attach all this meaning to it. We clearly see he didn't love her for her looks (what a beautiful speech, seriously!) and know that he would accept her in a second. But when that perfect girl is all she's ever been in front of him, I can't blame her for wanting to run away and preserve her beautiful first love in her memories. I guess the point is I'm really charmed by how much thought the writer has put into it's themes. It's not actually going to be about being ugly or pretty, but, ultimately, about being accepted by the person you love no matter what and about being confident enough in your own skin to stand in front of them. I can't wait! Aw, and the two girls really are the best girlfriends to grace dramaland in a while! Thanks for the recap, JB. Chandler, you put it so perfectly about Hye-jin's point of view. Everyone should read this comment! About the first love thing, yeah it's played out, but I love that this isn't a Coincidental Meeting of Fate. He sought her out and proved that you don't have to wait around for fate to decide if you should be with your first love. And I'm only halfway through (had to stop and squee about it so far! ), but their first love story is already the cutest first love story in all of dramas. It doesn't have to be all tragedy and angst for it to be meaningful! Good point about Sung-joon's mistake with the girl in the pink jacket is exactly the same as Hye-jin's mistake with the guy in glasses. The fact that she read so much into it, while understandable, does point to some insecurity on her part. While she overall seems bright and optimistic and strong, the turn her life has taken (i.e. her loss of wealth, her unemployment and "bad" schooling) has definitely taken a toll on her self-esteem. omg. I cannot get over how much I am in love with this drama already and it is only ep 1!!! so so so glad you guys are recapping it here!! Thank you!! also I go between wanting her to keep the hair and changing it...like not even a huge change but I like when she has part of it up..but the skin and clothing style I am all for staying. As a woman with blemishes myself I don't think that one needs to go. Any ways I really do hope they do a good job with this. I would also say there is nothing wrong with wanting to look good every once in a while (not that you were!) and to put extra effort in it. but I would hope that it would be on her terms and for herself should she want it. (so not to fulfill society's expectations).. I am having flashbacks to the hair issues in Full House 2. "As for Park Seo-joon… omg why is he so hot? " - I know, right javabeans? Also, I want the job of screening all English songs used in kdramas - please, ask me before drudging up some ancient Carpenters or other has-been song to kill the mood. Why does the lighted spray of many fountains hug always do it for me? I never tire of it. Never. I have good reason for high hopes for this kdrama after ep 1. Yay, kdramas are back! Carpenters.... has-been... ??? Seriously you're attacking an iconic love song, sung by one of the greatest voices who ever lived (the late, very lamented Karen Carpenter)?? Other songs that drive me crazy in kdramas: In the Arms of an Angel (Yong Pal to name one), Bee Gees - Cant Live (if Living is Without You) during the fight scene in the Korean movie Twenty, to name a couple. It is disorienting and doesn't feel like a good match. Personal taste, I guess. IMO the use of Can't Live during the slow-motion fight scene between the guys and the gangsters in Twenty was brilliant. That whole scene was priceless, I laughed so hard. I love this song myself. It's not a happy song, it's melancholy but hopeful. Love can be joyful, but it can be painful too. And Karen Carpenter could make you feel the pain. Owl, I don't know if you are familiar with Karen Carpenter but she was crazy talented and pretty. Nonetheless she died of anorexia. Basically starved herself into heart failure because she felt she wasn't beautiful or good enough. So to me the song's inclusion in a show that addresses a woman who is not pretty in everyone's eyes, it makes total sense. I may not love the song, but the singer was remarkable. I could weep at the songs we've lost because Karen Carpenter never had a chance to sing them. I think the contrast of somewhat saccharine romanticism with baby makin' hard rock is perfect. I love the two choices introducing the male leads. Of course as a rock lover, I'm totally rooting for SH. I liked this use of "Close to You" though, because it highlight how they became friends. Like, Sung-joon was so hesitant to be friends with the pretty girl because of his insecurities until he realized that she genuinely wanted to be his friend, and so they've been together ever since. Now, when they part and as they grow up, the song also highlights Sung-joon's search for her to see her again. So many good vibes from the first ep. Already in love!! But i don't want an image makeover. Nooo!! I think she will make herself a little more pretty (nice clothes, straightened hair etc) since the extravagent ajhumma editor told her employees need to be 'MUST' standard. But those little makeovers is what we do in our normal life too. So I wouldn't worry too much. we always have a bromance, its good thing now there will be girlromance (dunno what term is suitable). Oh seriously, am I living under a rock or has no one thought of this before? Of course it needs to be GROMANCE! LOLOL. I love it. Bromance was a given (I hoped) for this show but I didn't see the gromance coming. So happy!!! I juste hope this womance won't get ruined when bestie falls for hot new editor... please drama, show me a girl who respects the girl code ! AMEN! The gromance, homance, whatever it is we decided to call..is AWESOME! Don't mess with it! ohmy thanks for the recaps! okay, i love love that your recapped this! thank you! i agree with your on all accounts! so i'm right that SJ feels something off with HR when he meet her as HJ, Sj seems awkward, not the awkward since they havenn't seen each other. i also agree that they shouldn't pretty her up because the point in her is for the acceptance of who she is, not the physical. but they could do something with the hair. although i have a guess that they won't since they've shown that the change in her may be due to genes (not sure) her father's side. haven't watched it with subs yet. and oh my golly, i fell in love with park seo joon all over again. he is so freakin' hot! and he has this air inthe character that just makes it more real. i am on this drama for the long haul! 100,000,000 likes back to you! you should! really great one! 100,000,001 likes back to you! YES, I am watching it. My only fear is that Ha-ri will fall in love with Sung-joon too. That would be a crime! Nothing must come between their friendship. i like it so far, i know that title of the drama give some a pause including myself but from the plot i got a outcast kind of feel not so much of omg she's so ugly ironically. I suddenly reminded of that ridiculous korean job resume / requirements. We foreigners might think this story is awfully cruel towards hyejin, but then its apparently not entirely fictional in a plastic surgery nation. sadly it's not fictional at all...given that your picture is a requirement in a CV. I see. :) D-Day is going to start around the end of this month, right? I'm only 30 minutes in, but I'm already loving it! I love Hwang Jung-Eum here. At first I was apprehensive about her uglification, but it's not so outlandish that it's comical. It's rather real, and I like how you put that it's not so much how ugly she is (which is in the eye of the beholder anyway), but the effects her looks have on herself and others. I've never had such a strong response to a show 30 minutes in. I hope this is good! I still need a good rom com for the year! Yeah, I think they did a good job with her makeup as well. They made her skin look uneven and full of pockmarks, ruddied her cheeks, and frizzed up her hair to a...dramatic but not outlandish extent. Even though I look at her and still see a pretty girl, I don't have to jump through a bunch of logical hoops to understand why people in the show treat her like she's ugly. Not looking forward to the inevitable makeover--but until then, I can appreciate the good job the makeup artists did in making her look a little less than model-pretty without turning her into a joke. I love her too - a totally winning character and a really great actress-character match-up. I think she's adorable. I am getting vibes from "Yo soy Betty la fea", the Colombian original to "Ugly Betty". A really prepared, elite, and hard working slovenly woman outcasted for her looks but that at the end of the day saved her "Ecomodas" company. At the end of the run, she got prettier (but not as pretty as actress Ana María Orozco can be) which was a pity. Yes! That is exactly what I was thinking and came here to say! The whole Most Magazine sitting atop the other publications at the company reminds me of Mode Magazine at Meade Publications in the US version. Definitely some strong material with this kind of approach which they've mixed up, because of course our heroine will truly succeed not from getting prettier but from getting more confidence and self-worth. Oh, and showcasing a pretty awesome friendship between girls is always a plus with me! I'm slightly concerned about the central misunderstanding--I feel like I'll get real tired, real quick of Sung-joon not knowing that the real Hye-jin is his first love. It's the same problem I had with The Truth About Cats and Dogs, and also basically every drama ever: there's a point at which comical misunderstandings stop being so comical. At some point, you just want to lock characters in a room together and force them to JUST BE HONEST ABOUT THEIR FEELINGS. The best way I think this can be handled is for SJ to find out HJ identity pretty early on (say, ep. 6). Any longer, and I think the central conceit of the show's going to get old. But still: I love the characters, and I'm probably going to stick around for the long haul. I have a feeling Sung Joon will confront HJ about her identity next episode. Can't wait for tonight's episode. Yeah, I agree. Earlier will save the female friendship as well, before the jealousy gets too real between both of them. It's why I breathed a sigh of relief at the latest episode of Twenty Again. These are my favorite kind of stories -- mistaken identity. The process of him figuring out it's her is always so romantic. Hye Jin will accidentally say something that happened in their past, which will remind Sung Joon of his childhood best friend. Then Ha Ri will accidentally say something that never happened in their past (like his dead mother), which will make Sung Joon suspect she may not be his childhood best friend. Then Sung Joon will secretly test Hye Jin on something only the two of them know, which will make Sung Joon realize she is his childhood best friend and confess. *sigh* This is like the TV movie "Christmas in Boston" with Marla Sokoloff. Their not-reunion broke my heart. Her (falsely) believing she was right to hide, and him sooo not wanting to let "her" go. When they were thisclose to meeting by the fountain, I braced myself for his reaction. I thought, "he better not be mean to her before I write him off my list." But as soon as we saw how much he missed her and never forgot her after 20 years, I know he would still love her without caring about her looks. Plus she doesn't even look half bad. I also have full confidence that Ha Ri will not try to steal him from her. Little Sung Joon's airport kiss made me tear up. I love that Little Hye Jin loved him as a chubster. Jung Da Bin is stunning. I hope the ratings improve because I love this show and its characters already. 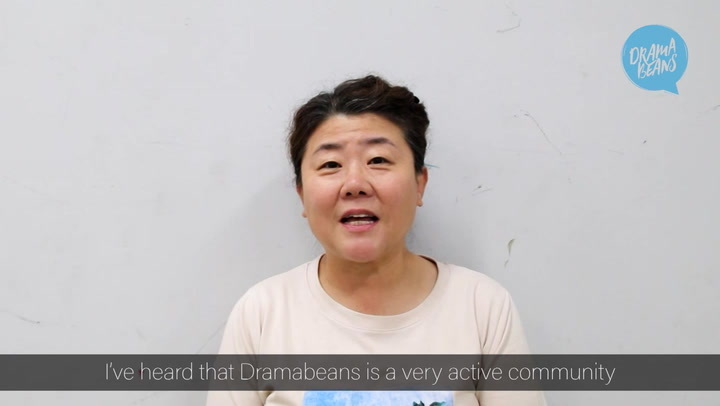 A big thanks for the recap, javabeans! I was just as worried as you that he'd be mean to her at the fountain, and I'm glad that he acted just as sweet as he was when he was a kid. I guess we'll have to wait until the next episode to see what Sung-joon is like when he's not on a date with (the person he thinks is) his first love. I'm really really really hoping that he's not another jerk of a male lead--it's my biggest turn-off with dramas. However, all signs are looking positive: like him getting the pretty girl out of the elevator so that Hye-jin could rightfully keep her spot. Here's hoping that he stays nice. Jung Da Bin is now grown up as pretty girl. i remember her as a cutie pie during Wonderful Days. hehe. I tried this mostly for my love of Go Jun-hee, I like Hwang Jung-eum and the others, but I love Go Jun-hee. I was surprised by how quickly I found myself loving the drama and everyone in it. "I loved her as a child for being sweet to Sung-joon and not thinking anything of his appearance,"
I loved that, I was a large boy and remain a large adult and to have anyone in media especially in a Korean drama not care about appearance like that just makes me happy. OMG ??? I was asking for girl friendship for KBS sassy gogo but MBC gave me that here in this drama ???? I ship the 2 girls together!!! Girl friendship all the way!!!! why is the second female lead wearing her shirt(s) in such a weird and unnatural way? cant understand korean fashion or definition of chic! I was also wondering what kind of top it was that had such an unsual neckline until i realised she was wearing a shirt in a off-shoulder sort of way. Even in the show's promo pic she is wearing a red cardigan in the same way. Although I must say that Go Jun-hee pulled off the look and her fashion style as Ha-Ri reflects her confidence and daring. I find myself looking forward to her outfits in the show and how it will complement her character arc/development. You know whenever I see Hye-Jin the thing that pops into my mind is, I really hope they are taking care of Hwang Jum Eum's hair. All that perm and spray to make the hairstyle stay can be really damaging, though she's a celeb so I'm sure they have a good hair styling team. Yay for good female friendships! We need more of these, and not just in the beginning of the series but throughout the show too. Now I just need more Shisus (Siwon, you really need to look up this nickname fans have for him, it'll make your day). I'm glad we have a good start for another rom-com, hopefully this can fulfill the hole that OMG has left in me. Oh my gosh, this drama is everything, EVERYTHING I tell you. 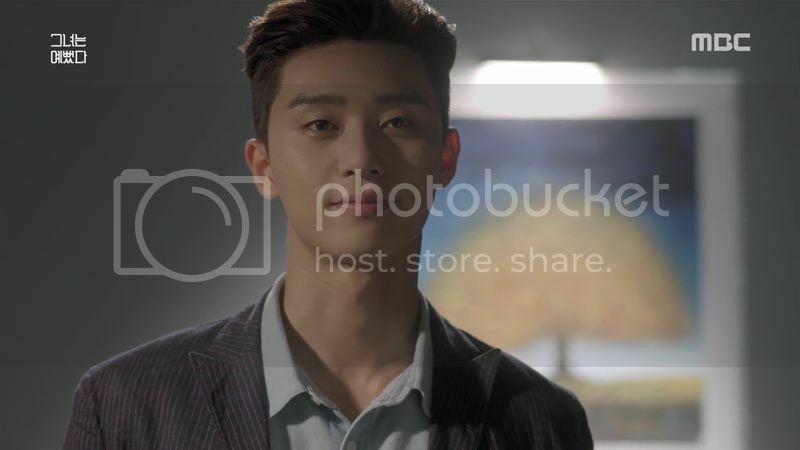 And wow, Park Seo-joon is really handsome, I feel like I'm really seeing him for the first time. This drama reminds me a lot of the Bollywood movie Mujhse Dosti Karoge, I could just hear Rani Mukherjee tell Hrithik Roshan "You thought in your mind that she couldn't be me because she was so pretty. You just walked past me that day." I love Hwang Jung-eum and I hope her character doesn't get a makeover and become pretty all of a sudden since her sudden 'ugliness' is just part of her DNA, you know like some people become smoking hot once puberty hits. Oh, I'm not Indian, I just really loved watching Bollywood movies a lot growing up. Dilwale Dulhania Le Jayenge is one of my favourite movies ever! Oh wow I never would have guessed that you weren't Indian! Sorry for the mistaken identity! DDLJ is my all time favourite movie. I am a big SRK fan! Oh and I saw this episode! It seems like the perfect start! ya you pointed out a good resemblance with MDK, but Rani Mukherjee was not a ugly girl there, she was just ordinary and shy where Kareena was really smart, stylish and outspoken. But here Hay Jin is declared UGLY!!! oh yayee! Indian Kdrama fans... I haven't seen MDK. But, I also discovered some time back that I love sappiness in Kdramas, but similar kinda stuff in Hindi dramas (which I stopped watching long ago anyway) is a huge turn-off. The uniqueness of Bollywood films are their songs. The story might be cliche, or predictable but their songs are the attraction, in my opinion. I've seen almost all the movies you mentioned except Highway, Dil Dhadkane Do and Band Baja Baarat. K3G, KKHH and the rest are classics forever and Taare Zameen Par made me weep so much. Thanks Fantasy! I am Indian and love the movies you've mentioned here except I haven't seen Highway and Jodha Akbar... and I didn't like Dil Dhadahke Do. When posting the initial comment, I was thinking of Hindi movies that'd match the good kind of K-drama sensibility... and Jab we Met came to mind. Love that one! Ugh, Kaisi Yeh Yaariyan was THE WORST! I've watched all the versions of BOF, the only version worse than the Bollywood one was the American one. On the upside though, I liked the OTP Manik and Nandini, they had chemistry for days. Rani was plain compared to Kareena according to the movie. Hrithik couldn't think that the girl he had been communicating with for over 15 years was Rani because in his memory, the girl he loved was the exotic Tina not the plain Pooja. oh guys, i just love Mujse Dosti Karoge so much. I can repeat it again and again. I just a fan of some old bollywood movies, especially Kuch Kuch Hota hai, Kabhi Kushi Kabhi Gham, Maan,and some others. (actually not really old, but its not recent also. haha). Rani Mukherjee is not being describeg as ugly, but rather she is sweet and shy compared to Kareena Kapoor's character. I just hope the friendship between female leads will be remained as now. Can we at least skip a thing like jealousy in this drama? I never heard of this movie, just googled it and found out there was Aamir Khan in here. probably will check it out later. Hopefully can find with Eng subs. Hey are you referring to Mann with Aamir Khan and Manisha Koirala?! Yeh Jawani hai deewani was good as well.. So I tuned in, not expecting much. But MAN! I love the characters already!! Totally blew away my expectations, because I was like...the plotline sounds a bit absurd, how could they possibly tell a story with that? Thank you to the writer or proving me wrong! One thing is true, this writer spun a captivating storyline. Got sucked right in from the get-go...and I am thrilled that the two female leads have such a beautiful friendship. Loved how Ha-ri stood up for Hye-jin when that dude said how she possibly could have a friend who 'looks like that' and ramming her heel into his foot! I really love how they bounce off each other, like two peas in a pod. Knock on wood, though, that this will become muddled...I have a feeling that their friendship might become conflicted with her stepping in as Hye-jin with Sung-joon. Boo to that, because it's really refreshing to see two female leads in a drama not competing against each other and being absolutely catty. That being said...I was wondering how they were going to make Hwang Jung-eum "ugly." Honestly, even despite the frizzy bob and makeup, she still looks pretty to me -- kinda hard to see her made up as "ugly" when she's not. I just felt for Hye-jin, because she is bubbly and so gung-ho about working hard and being a great friend...and how she feels like she'll be letting Sung-joon down by looking like this now. I'm waiting with anticipation how they are going to unravel Ha-ri as Not Hye-jin. Yay She Was Pretty is finally here. Hwang Jung-Eum & Park Seo-Joon appearing on screen together again — the wait is over! I'm so glad it's being recapped here. Déjà vu...The scene where Kim Hye-Jin was soaking wet from her head to her toes I can relate too. Last Wednesday I had something similar like that happen to me. A sudden downpour of heavy rain. All I had with me at the time was a light umbrella. I'd accidentally left my larger umbrella at home. The rain was so heavy that it was seeping through my umbrella. My hair and clothes were just drenched. Squish squish was the sound emanating from my socks and shoes as I walked to my destination. I'm was so happy to see that Dramabeans was gonna recap this show!! I was so curious to how it would turn out and so I watched it and loved it!!! Its been a while since a drama has reeled me in since the beginning and just waiting for more!!! All the characters I can't help but love. I thought I wouldnt really like Ha-Ri but she got my vote when she defended her 'wifey' in front of the guys. At first I thought it was weird but as it went on it just got me squealing. It is so refreshing to see the two lead females have such a close relationship and I just cross my fingers hoping it will stay like this. I have total good expectations of this!! Yay! A rom-com at last! This was a great first episode. The set up was there, so was the funny and the whole episode was interesting and fast paced. I loved seeing the sister from Oh My Ghostess and the department store lady from Mask. This is definitely one of the best first episodes I have seen in a kdrama and I hope they keep it up. Thanks for the recap JB! I really love the hubby/wifey relationship between the girls. I hope they are able to stay supportive of each other for the duration of the show. So far I loveee the sweet humanity in the Cyrano triangle, but have no opinions on motorcycle guy. Im in love with this show already. Between this and Twenty Again, I'm practically in heaven! Park Seo Joon is everything. Soo. ..did Ding Dong get his first kiss? Went straight to Comments part of recap. Thanks. Was busy but you make this sound too good to miss so I won't. 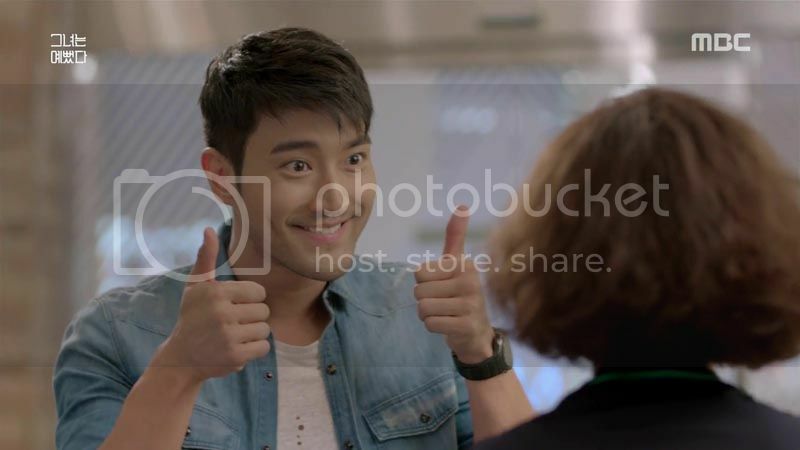 Just finished re- watching king of dramas in anticipation of Siwon being silly in this drama. He has matured in the last few years and I am pleased to say that this character is different from his kod character! Perhaps all that work in China has been good for his craft. Me too. Me too. On top of that, I have office...... uuugghhh.... sometimes I hate my life. Breaks my heart when he walks past her. Totally in love with this drama now. Looking forward to ep2. I love love love love love love this! Hwang Jung Eum looks more "natural" if that makes sense, but I love her aesthetic so far! I'm totally tuning into this drama! *does a little dance! I normally only watch a show when it has ended so I can marathon it in one go, but I can't help glancing through the recap for PSJ. Super excited to hear that the show is good! Why can't I be like you? I remember the blissful time when I just marathoned shows all in one go. It was great. But while it's torturous, I think I've come to enjoy the excitement of live-watching too! The cast is great and Hwang Jung Eum is just awesome!!! I have a feeling I'm going to fall very hard for this show. It's been so long since a show has resonated with me in the way the first episode of She Was Pretty did. The characters are all so likable and the execution of the premise was great! Boy am I glad my man Park Seo Joon chose this over High Society! So love at first sight? I think so! Stay awesome, show! "Just a little more spazzing: Something about Sung Joon being THE guy from the elevator made me squeeeeee way more than I should have so such a simple gesture…"
That was a good and simple scene that gave us a small hint about Sung Joon's character being not shallow since he had no qualms about kicking out a pretty girl if they deserved to be kicked out. 1st episode and it is so good. All 4 leads were introduced in perfectly woven story. I'm not disappointing at all, drama!ry. Love it! Very strong first episode. Wasn't sure about this drama at first. I agree with Javabeans, Hwang Jung Eum's acting can be somewhat exaggerated at times but as Hye Jin as of now, it plays well to the character. I love all the main leads. 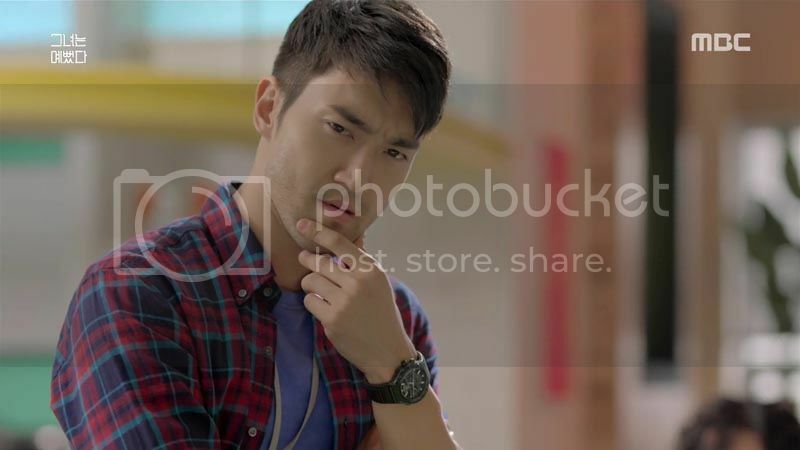 Siwon is hilarious. As for Park Seo Joon, have been waiting for him to lead a drama since Witch's Romance. So yes, finally. And he is looking mighty fine. A committing madcap comedy on public cable prime time? I'm impressed (and for once not even bothered by the Queen of Overacting, great casting). On the nitpicking side, I thought that the fast pace not very consistent throughout the episode; there was a little too much crammed into it at some points (especially towards the end). I understand the intention though. The other thing that bothered me: If I took those scenes seriously, I would be inclined to think that the protagonists are ridiculously shallow or perceptionally challenged. So the only thing this guy remembers about this very important and special girl is that she was hot? He doesn't remember her voice, her facial features and expressions, her gestures, etc.? He got an update on her voice by phone just now and he still doesn't notice anything when he meets Ha-ri? I have to say, this is a little bit disappointing, even when considering just how shallow K-dramalanders are. With all do respect, she doesn't resemble her older image much after having grown up. He mistook her for someone pretty because in his eyes she was this perfect girl with a kind heart and warm personality. It was same for Hye Jin as well, she thought the fat guy was him. If we really want to talk about being realistic than lets be honest, in the age of instagram, snapchat and facebook, it wouldn't take Sung Joon more than a few minutes to find out who is who in this whole scenario. The show has a whole lot of heart, well sketched characters and pretty decent writing and editing judging from the first episode and I hope it continues, that's more than I can say for the highest rated drama that's been airing now-a-days. With all do respect, she doesn’t resemble her older image much after having grown up. He mistook her for someone pretty because in his eyes she was this perfect girl with a kind heart and warm personality. You plead "first love amnesia" then? That he only remembers that he liked her but he forgot everything about her actual person? To Hye-jin's defense, she didn't have much to work with to notice her mistake, very much unlike Sung-joon. If we really want to talk about being realistic than lets be honest, in the age of instagram, snapchat and facebook, it wouldn’t take Sung Joon more than a few minutes to find out who is who in this whole scenario. something everybody does on a daily basis. It's entirely possible that a person would not do this in an instance like the one in the show (before the first meeting). Sung-joon does never even suspect that Ha-ri is not Hye-jin. He should have, simply because he has to have an idea about her that doesn't match with Ha-ri, like the voice he talked to on the phone (but maybe he suffers from phonagnosia and then some). But he didn't. Which means he has no motivation to verify her identity afterwards either. The show has a whole lot of heart, well sketched characters and pretty decent writing and editing judging from the first episode and I hope it continues, that’s more than I can say for the highest rated drama that’s been airing now-a-days. Could we please not stoop so low as to drag "Yong Pal" into the discussion? Pretty please? Overall, I agree, the show is off to a great start. There were some inevitably irritating issues bound to happen, and I'm not too concerned about them. What bugged me about the Cyrano setup is that this is part of the character introduction. In concreto: Why did they have to include the phone call at all? Why did Sung-joon have to know Ha-ri? Without these two issues that seem to be completely irrelevant to the plot so far, it would be much easier to suspend my disbelief. I suspect that there may actually be a reason within the story to include these bits: Maybe I'm supposed to think that Sung-joon and Hye-jin have only rather shallow/distorted images of each other. "Could we please not stoop so low as to drag “Yong Pal” into the discussion? Pretty please?" "He doesn’t remember her voice, her facial features and expressions, her gestures, etc.? He got an update on her voice by phone just now and he still doesn’t notice anything when he meets Ha-ri? I have to say, this is a little bit disappointing, even when considering just how shallow K-dramalanders are." i believe the writer has her purpose in having this played out, although if i may, sometimes, our voices during phone calls may vary from the actual and in fairness, just like what JB had mentioned, i also think SJ notices that something is off with HR being HJ. i admit that SJ will know early on, not by admission from HJ but by his own observations and interactions with her. I don't watch Yong Pal dude. Haven't so far. Plan on watching later after the show finishes because I keep track of very few show while on air as it stresses me out unless my absolute favorite people are in the drama. If I wanted to talk about that drama here, I'd mention the name. So far, I've heard good stuff about it. Please, don't politely insult me for stating an opinion. Not cool at all. Suspension of disbelieve is what I referred to, yes but I don't agree with you on the point that finding people from you childhood is equivalent to cyber-stalking. Cyber stalking is far more serious and scary thing to mention when the topic of discussion is a breezy rom-com. Sung Joon knowing Ha Ri back in the day was not a big deal. The writer just wanted to establish that Ha Ri had also known Hye Jin for that long without having to setup separate scenes just for them. It was killing two birds with one stone. "Maybe I’m supposed to think that Sung-joon and Hye-jin have only rather shallow/distorted images of each other." - Hm, I'd agree that a part of the image they have of each other is shallow. After all, they were kids and they probably just naturally expected they'd both grow up the same visually. But I don't think the drama's central misunderstanding is supposed to be quite as indicative of that as it seems. To him, it's just not conceivable that his confident first love would send someone else in her place, so, no matter how "off" it felt, he probably ascribed their unfamiliarity to how long they've been separated. I guess what I'm trying to say is that it makes sense that he'd want to believe in the girl saying she's Hye Jin precisely because he wants to be able to "recognize" the dream girl from his past as soon as she's in front of him. I think, with the way the drama is set up, that this whole find the hidden picture game is going to be about him rediscovering his connection with the girl inside. We see from his speech that there is a deeper connection to her as the girl who stayed by his side when no one else would. But the distinction between the shallow and the deep aspects of a person is that the deeper aspects take longer to come to the surface. As the drama unfolds and he spends time with the real Hye-jin and the fake one, he'll be given the chance to see if he can find his dream girl even after he's convinced he already found her, even after she's become the peeping girl of the puzzle. Will Hye-jin's actions have the same affect on him now that her outer shell is different? That will be the true test of whether his image of her is shallow or not. Your reaction to Yongpal being mentioned is more surprising than Yongpal being mentioned itself. Yongpal did start off great and it has dwindled down to a lot of "whut" as episodes went by and it is indeed the drama with highest ratings right now. To hope that this drama continues with the great start and not end up like Yongpal in a few episodes is a normal thing to say and hardly out of line. No one stooped low by mentioning Yongpal. What I do find interesting is why mentioning it is considered "stooping low". Is it such a low blow that watchers should censor themselves from ever mentioning it even in relevant discussions so as not to offend anyone? Kinda weird, no? Watched first episode and it made me all misty. If I did not even watch another episode that first one was great all by itself, but I definitely plan to watch more. I am pretty sure the girls will have a conflict because at the moment the friendship is almost too perfect. I just hope Ha ri wont become an evil enemy for the sake of a (love) plot. I wish for a conflict that will add another valuable meaning to their friendship later. Maybe like a parallel plot about overcoming obstacles in friendship. I don't see many of these kind of plots in kdrama (at least in weekdays dramas). This first episode was really good to me (for the reasons already stated in comments above), especially because it can go in many different directions. I notice that many first episodes are like that, they pull me in because of curiosity how it will countinue (which means the productions are doing correctly;)) but later almost all go the same route. Why is that? Do they fear risking being a flop or do koreans love that similar concepts that much? I've noticed it's almost all about ratings and if this series won't see a rise in it i fear for a change of concept and all that stuff. But i should wait worrying about it, it's only first episode. This drama is very addicting even with just the pilot episode.